Pumpkins are a good source of Vitamins A and C. The bright orange color of a pumpkin indicates that a pumpkin is loaded with an important antioxidant, beta-carotene. It is converted to vitamin A in the body. In the conversion to vitamin A, beta-carotene performs many important functions in overall health. California ranks second in production of pumpkins behind Illinois. 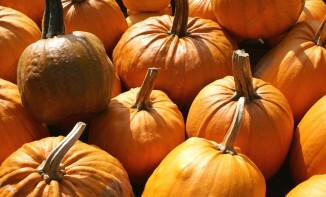 Eighty percent of the U.S. pumpkin supply is available in October. In California, about 90% of pumpkins are grown specifically for Halloween. Most pumpkins are sold in local markets or directly to consumers at you-pick pumpkin patches, farmers’ markets, and food retail stores.